Why is it that most places I go the cedars are brown and many have almost no foliage? Is there some kind of blight, a lack of rain or are the trees dying naturally? According to Taylor Scarr, provincial forest entomologist at MNR, the “browning” is the result of coincident attack by several of the cedar leafminers – tiny, native caterpillars (larvae) which eventually become moths – of the genus Argyresthia. The main culprit appears to be Argyresthia thuiella. Four species of leafminers attack white cedars in eastern Canada. The damage occurs when the larvae feed by tunneling through the tips of the leafy branchlets. In the process, the foliage begins to turn brown and is later shed. By holding the dead foliage up to the light, it sometimes possible to see the larvae within their feeding tunnels. The larvae pupate within the tunnels in the cedar leaves and small, silver-grey moths appear from late May until July. Significant areas of defoliation from leafminers were also recorded last year and in 2011, especially in parts of Douro-Dummer Township. According to the Pest Diagnostic Clinic at the University of Guelph, removing and destroying infested branch tips before the moths appear will give adequate control in the case of light infestations on small ornamental cedars. White cedars can withstand considerable injury from leafminers before significant damage occurs. THIS HAS BEEN A BRUTAL YEAR for cedar leafminer injury on eastern white cedar (Thuja occidentalis) and its selections. I have received more phone calls about this pest in the landscape than any other this spring. Cedar leafminer (CLM) is actually a moth and there are quite a few species that have been identified on cedar in Ontario. 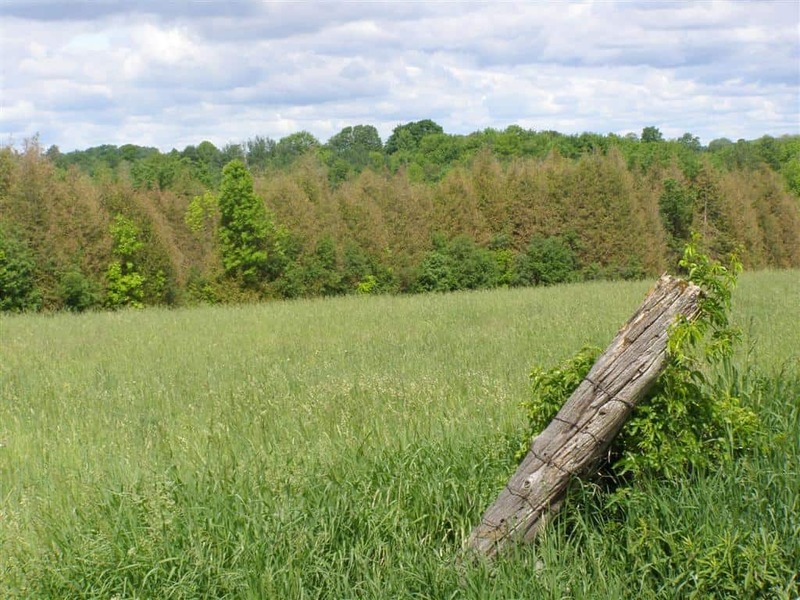 The Ontario Ministry of Natural Resources has identified species of cedar leafminer in the genera Argyresthia and Pulicalvaria (Coleotechnites). As the name implies, the tiny moth larvae feed within tissue inside the leaf scales from summer to the following spring. The tissue turns brown, especially in the spring, since it is the period of heaviest feeding. You can find the larvae feeding inside tissue from late summer to early spring. Try peeling open the leaf scale right at the junction of green and brown tissue. The tiny larvae range in colour from brown to yellow to green with a dark head. You can tell cedar leafminer damage apart from winter desiccation because the leafminer hollows out the leaf scales, it will look papery when you hold it up to the light. You will be able to see the insect or at least a tiny, round emergence hole from where it left. Some CLM species pupate inside the leaf scales; others emerge from the leaf to spin a white cocoon and pupate just outside the leaf scale. The stage you saw in late-May and June was the adult stage, the tiny (3-5 mm long) white-grey moths that flutter around the foliage when you disturb them. They have laid their eggs and the larvae will be hatching and tunneling into that new, lush foliage to hunker down and feed for the next several months. Cedar leafminer has several parasites (e.g. tiny species of wasps) that lay their eggs inside the body of the leafminer larva or pupa. The parasites will feed inside the CLM larva, eventually leading to its early demise. Usually, predator-parasite populations are only just one or two years behind the pest population. Hopefully this will lead to a significant CLM population crash in 2011 or 2012. Most trees can recover from CLM attacks. However, when trees are repeatedly infested over multiple years, CLM can sometimes cause branch dieback. Tree mortality is possible but more so during hot, dry years and repeated infestations. In Ontario, products that are registered to manage CLM are not exempt from the Cosmetic Pesticides Ban. 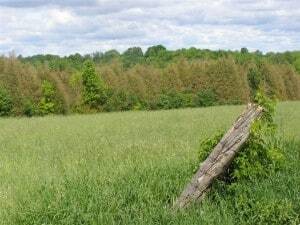 If you want to make an application of a non-exempt pesticide, you need to work with the Ontario Ministry of Environment to get an exception for the infested trees. As for cultural management, a light sheering of the infested trees in early-mid August should remove a lot of the tips that are infested by next generation larvae. As the fallen clippings desiccate and start to break down, the larvae will not have a food source and will be unable to complete their life cycle. Avoid nitrogen applications around infested trees until the following year since the added nitrogen and pruning-induced lateral bud break can lead to excessive vegetative growth that does not acclimate in time for winter dormancy. Or, in other words, more tip browning next spring. February 27, 2013 – Why were there so few Blue Jays this winter? What do I do if I find an animal in distress?